Feel great today - feeling better everyday actually ever since Saturday. Quite interesting how for a week you feel like absolute garbage and then the recovery starts in earnest and you start genuinely feeling better. Today was a great day, I slept more last night / today than any other night combined over the last week. I seem to sleep for about four hours maximum and then I am completely awake but last night I awoke at around 4am and then was awake until around 6am and then I told myself to try and go back to sleep which I did and woke up at almost 9:30am! Fantastic! I do very much look forward to sleeping on my side again rather than propped up in a bed but if I want my jaws to sit straight and also be able to breathe then that, as they say, is the sacrifice you have to make. I had to laugh today as I find myself slurping for want of a better word more than ever! By this I mean I seem to be producing a serious amount of excess saliva and given that my mouth is closed shut the only way to swallow it is to slurp it back to my throat! Not sure why this is suddenly happening but it is and so I am slurp monster presently! Nothing more pleasant for the family than sitting down to dinner and every minute or so have the conversation interjected with slurp, slurp, slurp. 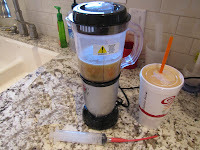 . .
A good friend brought around a Jamba Juice smoothie later this afternoon - they taste so good, although cursed be my back left sensitive tooth for limiting how much I eat! :) It was a peach and mango smoothie and although it obviously takes an eon to syringe, it is worth it plus it is healthy for me so a double bonus! The swelling on my face is going down considerably as no doubt you can see in the picture though the right side of my face is still more swollen than my left. My chin feels like it has pins and needles constantly and I dare not touch it because it feels like it is on fire when I do. All good signs where my nerves are concerned however. The bruising continues to dissipate and I confident by the end of the week I will not look like someone has mugged me! I need to ask the Doc. why my neck is so bruised all the way from my chin to my chest. What did they do to me in the operating room? Anyone have any ideas? Breathing is almost back to normal although I continue to use the nasal medicine as when I do not take it I become rather congested which again, is neither a pretty sound nor a pleasant feeling. I look forward to being able to blow my nose! Again, the things we take for granted . . .
A few people have asked about weight loss and how much I have lost to date. I will try and remember to add that to each post from now on. So far, since the surgery, I have lost approximately 13lbs! I will write more about this topic in the next day or two. I have another follow up with my surgeon, Dr. Egbert, tomorrow. Looking forward to perhaps getting a few rubber bands off my teeth?!?! Fingers crossed. This is a key to recovery! For three days, ice your face to help reduce the swelling and numb the pain. After the third day, start applying heat in rotation with the ice. If I do not do this constantly, within about ten minutes my face starts to tense and tighten if that makes sense and that does not feel so good let me tell you. I am almost forty years old so you would think I should have known this and perhaps it is because I have never really had anything major happen to me but pain management is critical to recovery. Continue with the meds until the Doc. tells you to stop taking them. Stop taking the pain meds too early = lots of discomfort and delaying recovery cycle. I really have not felt like eating very much, especially those first five or six days as I felt so crummy but you need to stay hydrated so eat. Seriously, you look horrible, feel worse , and the last thing you want is company, right!? Definitely my take on things but I genuinely have felt better when people have come around or contacted me; it made the time go by so much quicker which was a blessing! A support system, in whatever form, (in person, email, mail, etc.) is absolutely critical for recovery. I cannot even imagine going through this type of surgery without a support system. Well, that is about it for today! Tomorrow, the visit to the Doc and hopefully more freedom will be granted to me! Chicken Noodle Soup - SOOO delicious! If you haven't figured it out by now, the brushing in your neck and chest area isbjustbthe blood that was once in your head area that has made its way down through the tissues by gravity. So far no brushing for me, but we'll see if any appears. Bruising was interesting as it didn't show straight away. Took a few days and after a week or two I looked like I lost a fight in an alley! Combine that with the fact I couldn't talk and I was swollen, I looked great!